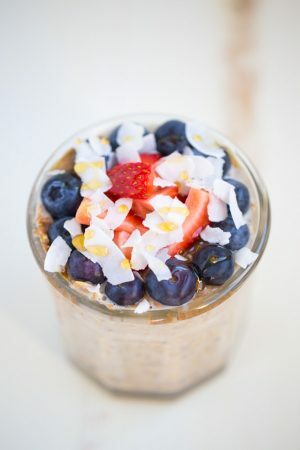 AMAZING Overnight Oatmeal Parfait! This vegetarian and gluten free parfait is super easy to make and is incredibly healthy, too! It’s full of healthy ingredients like fresh berries, flax, coconut flakes, almond butter and honey. Helloooo and happy Tuesday! Today I’m gonna talk about this healthy overnight oatmeal parfait and how I got the inspiration for it. It all started on a warm Friday afternoon in early May. I went to a place called Raw Juce for lunch with a girl from work. Before I went, I read over the menu MORE THAN ONCE because I am crazy like that and if I don’t read before going, I will take F.O.R.E.V.E.R to make a decision on what to order. I narrowed it down to some sort of raw cacao smoothie bowl and a raw oatmeal parfait. The parfait won and so did an impulse buy of dark chocolate caramel almond date bars. Mmm. Anyways, the parfait won and I bought it and was like DAMN, this stuff is expensive (over $15 for both things!) so it better be good. And it was INCREDIBLY good (and so were the date bars). But I told myself, I cannot buy this stuff every week or I will be as broke as a bad joke. So over the following weekend, I told myself that I was going to make my own creation of the Raw Juce oatmeal parfait…and I did it! Mission accomplished. I read online that overnight oats typically need a 1 to 1 ratio of oats to liquid. I used 1 cup of gluten free rolled oats and for the liquid, I used 1 cup of unsweetened vanilla almond milk. I mixed the two ingredients in a jar, covered and refrigerated for 8+ hours. For me, 1 recipe of the overnight oats makes two servings. This parfait is 2 servings or 1 serving if you’re incredibly hungry. This listing is in the order of how I layered the ingredients in the serving glass. The ingredients are very similar to the ingredient used in the oatmeal parfait from the juice place. My version is cheaper. WIN! AMAZING Overnight Oatmeal Parfait! 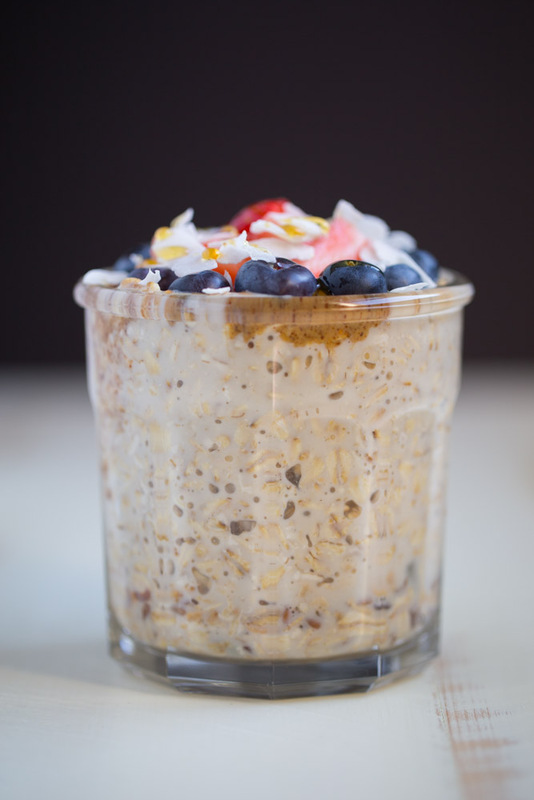 This vegetarian and gluten free parfait is super easy to make and is incredibly healthy, too! It's full of healthy ingredients like fresh berries, flax, coconut flakes, almond butter and honey. Make the oats. In a large mason jar or glass, mix the oats and almond milk. Cover and refrigerate for 8 hours. Assemble the parfaits. Once the oats are ready, sprinkle the muesli or granola and the flax in the bottom of a jar or glass. 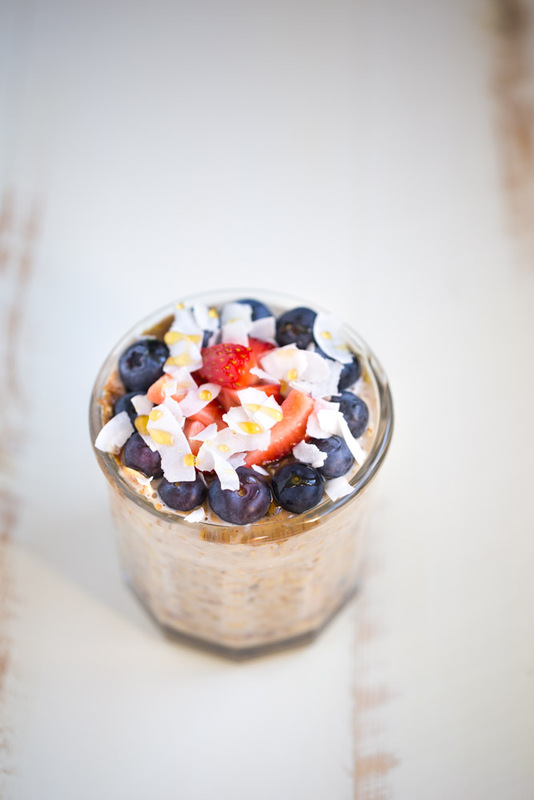 Top with the overnight oats and then the almond butter, fresh berries and coconut flake. Drizzle with the honey. I love that this is a breakfast I can feel good about eating :) Looks delicious! Ohhhh One of my Favorite things to eat in the morning is Oatmeal! Looks great! This looks amazing – and I love that it’s ready to have with my coffee! This is one breakfast I would look forward to — looks so tasty! I have a question: Can I use ground golden flax meal? I always have it on hand. Are you wanting to replace the oats with ground flax or add ground flax to the oats? If you are adding it to the oats, I would increase the liquid by the same amount of ground flax you add to the oats – 2 tbsp ground flax, add 2 more tbsp of the liquid. I think you could also replace some of the oats with the flax, keeping the same 1 to 1 ratio of oats/flax to liquid. As far as subbing totally with ground flax, I’m not sure how that would work. If you try it, please let me know how it turns out! To wake up and grab this to eat! Delicious! 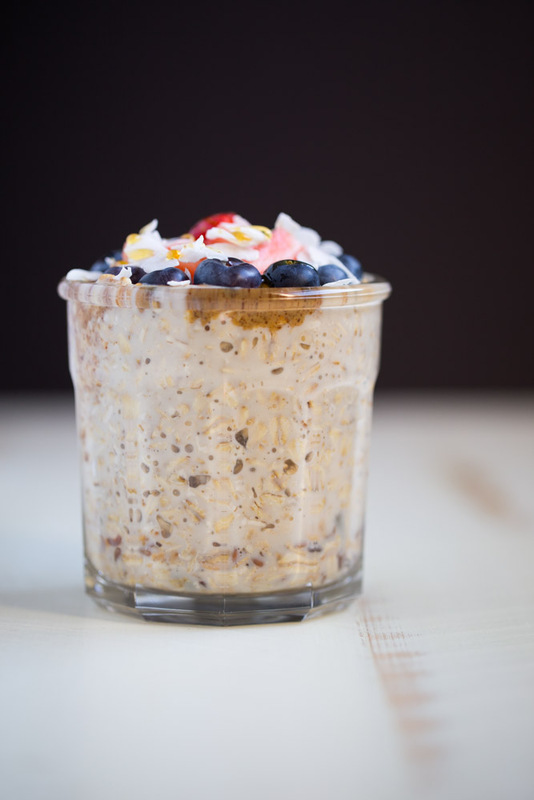 I’ve been wanting to try overnight oats, and now I’m inspired to do so with your recipe! Once you try them, I don’t think you’ll go back to stove-top oats! So much easier and tastier! One of my new favorite dishes, for sure! I love that you’ve added almond butter — yum, yum! You know I’m a fan of your oatmeal and this looks like another must try! I have all the ingredients I need to make this, and I’ve been looking for the an overnight oats recipe. This is happening for breakfast tomorrow!